Although greatly varying by design, cryptocurrencies are usually based in electronic networks of nodes, which are often structured as peer-to-peer (P2P). Each participant of the network may perform the functions necessary for the cryptocurrency to operate. This is done using automated software via dedicating a part of the participant’s computing power. Cryptography is used to ensure proper generation of the cryptocurrency units, to secure transactions, and the overall functioning of the underlying infrastructure. The most famous example of a cryptocurrency is Bitcoin. It is customary to call all other cryptocurrencies altcoins (alternative coins). In Forex trading, cryptocurrencies are used both as a method of payment (to deposit and withdraw funds) and as a trading instrument, forming pairs with other cryptocurrencies and currencies. The easiest way to understand Bitcoin and most of other cryptocurrencies is to think of them as electronic ledgers where each participants stores an electronic copy of all the transactions performed in the network. These ledgers are encrypted in a special way. Each participant has his own private key to sign new transactions in the ledger and has access to public keys of other people to verify their transactions. However, you do not need to understand this if you are only going to trade cryptocurrencies or use them as a funding option with your broker. The technical part is taken care of by the specialized software. Still, a trader who owns some cryptocurrency needs to pay attention to the security of funds. These cryptocurrencies are not necessarily better or offer superior use-cases (except for Bitcoin). They are just popular among Forex brokers and will probably be available to you in form of CFDs. It was the first cryptocurrency. Bitcoin was devised in 2008 by Satoshi Nakamoto. It is based on a blockchain, a publicly distributed decentralized peer-to-peer electronic ledger, which was launched in 2009. Bitcoin dominates the cryptocurrency scene in terms of adoption, market capitalization, and development. Bitcoin’s ISO code is XBT, but most trading venues list pairs using BTC ticker. Therefore, you will most likely see BTC/USD, and BTC/ETH when trading Bitcoin. Did you know? There were two splits in Bitcoin blockchain in 2017, hence BTC, BCH, and BTG symbols. Its widespread adoption means that when trading Bitcoin on exchanges, you will be getting the highest liquidity of all cryptocurrencies, and when trading it as a CFD, you will be getting the lowest spreads. Ethereum blockchain was launched by Vitalik Buterin in 2015. Its design is quite similar to that of Bitcoin. One of the biggest differences is that the cryptocurrency (which is actually called Ether, whereas Ethereum is the name of the whole platform) is inflationary in nature compared to the deflationary essence of Bitcoin. Another important aspect of Ethereum is that it provides smart contract functionality via its Ethereum Virtual Machine. Proponents of Ethereum consider it a great advantage and a step ahead compared to Bitcoin. The Ether currency does not have its own ISO code, but a common trading symbol for it is ETH. Did you know? There was a split in Ethereum blockchain in 2016, hence ETH and ETC tickers. Dash is a cryptocurrency network built as a decentralized autonomous organization. Originally launched in 2014 as XCoin by Evan Duffield, it became known as Dash in 2015. It uses Bitcoin-like code at its core but adds other features. The most important of them is PrivateSend, which enables anonymous transactions. Like Bitcoin, Dash is designed to have limited supply (deflationary model). Unlike most cryptocurrencies, the trading symbol for Dash uses four letters: DASH. Did you know? Whereas Bitcoin is a completely decentralized in its development, Dash is a self-governing network with votes, budget, and all. Litecoin was launched as a fork of Bitcoin source code by Charlie Lee in 2011, using different transaction processing settings (block generation speed) and a different cryptography algorithm (scrypt vs. SHA-256). Similarly to Bitcoin, its supply is limited by design. Litecoin’s trading ticker is LTC. Did you know? Litecoin often launches the new features planned for Bitcoin faster because Litecoin’s lower adoption level makes implementing controversial updates (like Segregated Witness) easier. Ripple is quite different from conventional cryptocurrencies. It is a payment protocol built on top of a distributed ledger. Ripple was launched in 2012 by the Ripple company. Even though the protocol is open-source, ripples (the currency used in the Ripple network) have all been premined by the developer company and cannot be mined by the network participants. However, it is not very important if you only plan trading ripples speculatively. The common symbol for ripple units on exchanges and brokers is XRP. Did you know? Unlike other cryptocurrencies, Ripple enjoys wide adoption among global banks as a technology for a fast and secure transaction settlement. The easiest way for many people to obtain some cryptocurrency units is via one of many exchanges (Bitfinex, Poloniex, Kraken, etc.). Conveniently, the same exchanges offer speculative trading opportunities to their customers. Not only can traders transact by exchanging one currency (crypto or fiat) for another, they can also engage in leveraged trading using a margin account. The biggest cryptocurrency exchanges offer margin trading using a leverage ranging from 1:2 to 1:5. It is not much compared to the high leverage offered by some Forex brokers, yet it is usually enough to increase the position sizes sufficiently to make the volatile movements in cryptocurrencies a lot more profitable or damaging compared to fiat currency pairs. Leveraged trading on exchanges is funded by margin lending provided by other exchange participants (margin investors). Traders borrow funds for each trade they make at a varying interest rate and pay it for as long as the position remains open. The entire process is performed by the trading platform in an automatic mode. 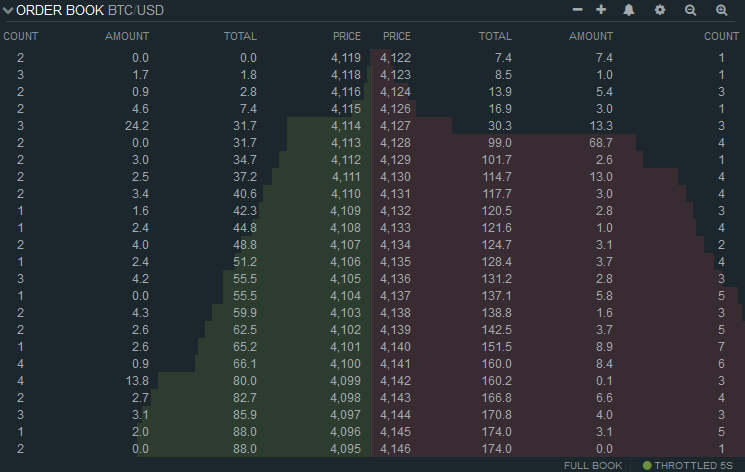 True order book with transparent deal and volume information. Your orders affect the price – an opportunity to manipulate the markets. Availability of cryptocurrency pairs. Some exchanges list hundreds of cryptocurrencies. A chatroom (so-called trollbox) is usually available to traders to discuss the cryptocurrency and its trading on the particular exchange. Low leverage, which is completely absent for less popular cryptocurrencies. The risk of exchange hacking. Big trades can be tricky to execute due to liquidity issues. Some exchanges require very detailed due diligence and customer verification process, imposing strict limits on deposits and withdrawals. Forex brokers had been quick to realize that they could be offering cryptocurrency pairs alongside the normal fiat currency pairs. They normally offer crypto trading in form of CFDs (contracts for difference), where each trade is effectively a bet as no exchange between assets is actually performed. In theory, this allows brokers to offer a higher leverage and lower commission, but in practice, due to low competition, these parameters remain quite close to their exchange counterparts. You probably already have an account at some FX broker, so you do not need to open an exchange account to trade cryptocurrencies. Trading infrastructure (MetaTrader platform, for example) is usually more sophisticated than on exchanges; it is also more familiar if you are an experienced Forex trader. Trading big amounts is easier – your deals do not affect the underlying market. Trading is nothing more than betting against a broker. Slow adoption of less popular altcoins makes the range of cryptocurrency pairs available for trading much narrower than on exchanges. You can see our list of brokers with cryptocurrency trading and read trader reviews before opening your own account. Regulated environment with nearly zero counterparty or execution risk. Low cost of opening and holding positions. Limited margin (between 1:2 and 1:3). Total lack of anonymity and limited liquidity. Trading Bitcoin futures on regulated exchanges might be a good idea if you are an institutional trader or a retail trader based in the United States. Otherwise, it might be not the best way of operating in cryptos. Why Trade Cryptocurrency Pairs at All? A common question asked by many new to speculative cryptocurrency trading is “Isn’t it better to buy and hold?” It is an important question, which does not have an obvious answer. 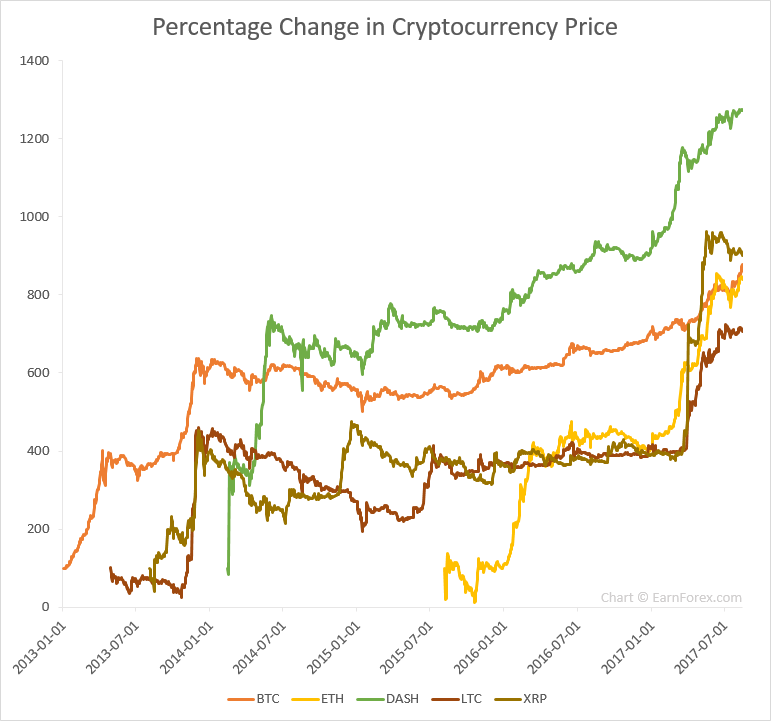 On the one hand, if you look at the long-term charts of the cryptocurrencies discussed above, you can see that they all have significantly appreciated against the US dollar in just a few years. The return on investment is thousands percent. Clearly, had you simply invested in Bitcoin in 2013, or earlier you would be well rewarded by now. On the other hand, all cryptocurrencies go through boom-and-bust cycles with significant corrections that may last for years. Margin trading enables monetization of such movements by shorting cryptocurrencies. At the same time, riding the rallies on leverage should allow higher gains than simply buying and holding the same cryptocurrency. Besides, some altcoins could lose their value completely, zeroing your investment in them. If you believe that you can be good at active cryptocurrency trading, then it might be a better choice for you than a plain buy-and-hold investment.